Saki-Hikari, professional koi diet, has been developed as a result of decades of first hand breeding experience and considerable insight from a number of Japan’s top professional breeders. Saki-Hikari is the diet used by the All Japan Koi Show Grand Champion winners in back-to-back shows since 2003. If you want the very best for your koi, look no further than the leader in koi nutrition worldwide, Hikari! 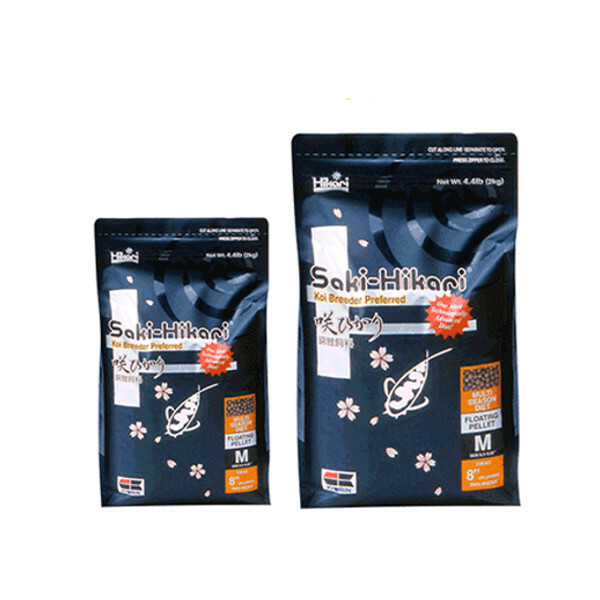 Saki-Hikari Multi-Season is the perfect diet for feeding at lower water temperatures. The combination of easily digested ingredients, including the inner most portion of the wheat-germ kernel and it’s high concentration of amino acids and vitamin-E, and the beneficial living microorganism provides outstanding digestive properties. This diet offers balanced nutrition for growth and carotenoids for superior color enhancing and can be fed in water temperatures as low as 50 °F. The inclusion of stabilized vitamin-C helps reduce stress and stress induced illness.